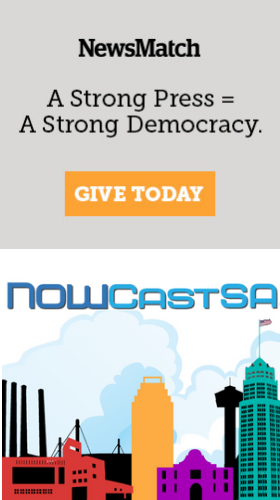 During our most recent NewsMatch fundraiser, individual donors gave NOWCastSA $13,681 that's eligible for matching funds - so your generosity will be doubled to a total gift of $27,362! But even more than that, we had wonderful support throughout 2018. As Valentine's Day approaches we want to assure you that we feel the love and return it most sincerely! Thank you for helping to further our mission to promote and facilitate an inclusive civic conversation through empowering the community. Your donations enabled NOWCastSA to share a live webcast of the San Antonio Public Library's program "Recovered Voices: Music Silenced by the Nazis." As a result of that webcast, the estate of one of the featured composers will now begin receiving royalties! Click here to see video of that amazing concert. Our webcast "What can be done about gun violence?" presented by the League of Women Voters of the San Antonio Area was watched by viewers in Philadelphia and Detroit, communities faced with their own issues of gun violence. Your gifts are empowering a national conversation about this vital issue. Watch the video here. Compassionate SA's Action Lab shared ideas about creating a kinder community. Along with support from the San Antonio Department of Human Services and Compassionate SA, your donations allowed us to livestream that workshop, and now it can be viewed by anyone. Click here to watch "Compassion Action SA Lab."